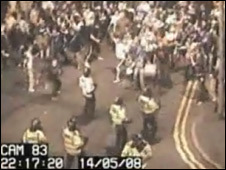 Two teenagers and 11 adults have appeared in court accused of violent disorder after riots in Manchester city centre following 2008's Uefa Cup final. They are alleged to have caused chaos following Glasgow Rangers' defeat against Russia's Zenit St Petersburg. Scott McSeveney, 21, of Shotts, North Lanarkshire, and Mark Stoddart, 25, from Glasgow, are also both charged with assault on a police officer. None of the defendants entered a plea at Manchester Magistrates. Andrew Holt, prosecuting, told the court about 150,000 football fans were in the city for the final at the City of Manchester stadium in May 2008. Mr Holt said a big screen for fans without a ticket to watch the match failed in the early evening, which triggered widespread disturbances across the city. Along with Mr McSeveney and Mr Stoddart, the other defendants are Greg McKenna, 22, of East Kilbride, Lanarkshire; Brian McVicar, 19, of East Kilbride; Gordon Forrest, 35, of Bearsden, Glasgow; James Bell, 42, of Cumbernauld, Glasgow; Thomas Murphy, 27, of Greenock; David McCullough, 20, of Burnage, Manchester; David Annette, 34, of Chorley, Lancashire; John Saunders, 31, of Cumbernauld, Glasgow; and Michael Hindle, 21, Leyland, Lancashire. All are charged with violent disorder. Two 17-year-olds, who cannot be named for legal reasons, have also been charged with violent disorder. All the defendants were given unconditional bail and will next appear in court on 5 October.